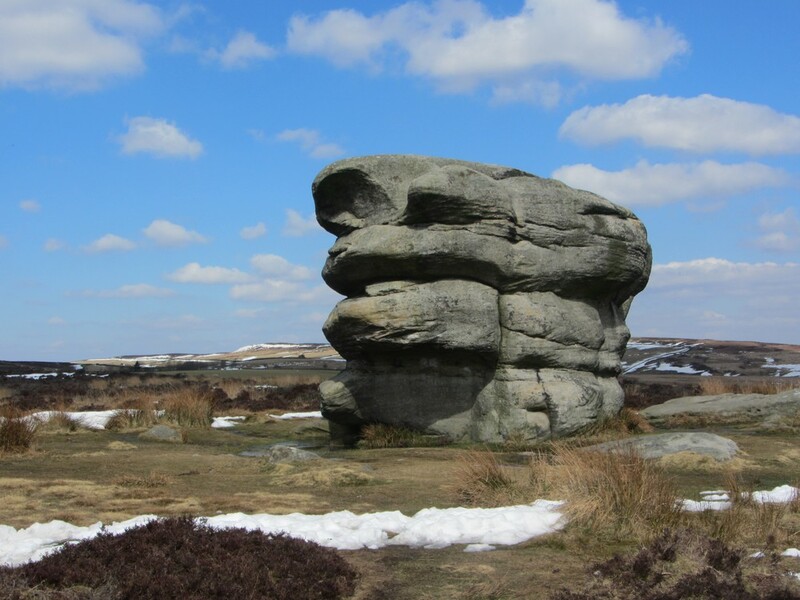 Our Four Gritstone Edges guided walk yesterday took us past The Eagle Stone which is set back on the moorland just a short distance from Baslow Edge. It is a huge tower of Gritstone with an interesting local custom attached to it. The age old custom is that before they are allowed to marry, the young men of Baslow have to prove their manliness and fitness for marriage by climbing onto the top of this huge stone. There is no easy way up because some of the higher parts of the stone overhang the lower parts. The village has always had its fair share of weddings though, so plenty must have managed it. A couple of years ago on one of our guided walks we did see a group of young men laughing and joking around the stone, one wearing a brides veil around his waist. His mates told us he couldn’t get married on Saturday until he had climbed the stone. They cheated though and helped him up! Our next guided walk along these gritstone edges that will pass The Eagle Stone is our ‘Four Gritstone Edges Walk’ on 9 May that forms part of the Peak District Walking Festival, and then the next one after that is on 18 August.